Since the first time I watched Tombstone, I’ve been a fan of westerns, a genre and setting for stories that I once thought was reserved for men–you know, gun-toting, hard-working, manly men. That movie, and others, including some John Wayne classics, reformed me. 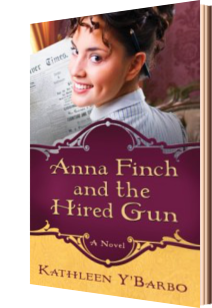 And books like Anna Finch and the Hired Gun by Kathleen Y’Barbo are making me a fan of written westerns. Anna Finch is an adventurous and unconventional woman who aspires to be a journalist when her father just wants her to get married. Unwilling to settle, Anna pursues her own interests, which lands her in the company of Wyatt Earp and Doc Holliday. She’s also often in the company of Jeb Sanders, a Pinkerton detective her father hired to keep an eye on her. The plot is somewhat predictable but the story is fun–a light read to pass the time–and I’d look for another book from Y’Barbo in the future. As a writer, I’m curious about where authors get the inspiration for their stories, and Y’Barbo’s explanation of how this story came about is interesting. I was left with a desire to rewatch Tombstone, and I couldn’t get Val Kilmer’s Doc Holliday out of my head. Overall, if you like the Old West and you’re in the mood for a quick, light, fun read, then check this one out.